October 2018 73 East Conservatory Plaza at Longwood Gardens Kennet Square, Pa. Located in Kennet Square, Pa., the design for the East Conservatory Plaza includes a comfort station building buried in a sculpted landform, a plaza space and accessible pathways. The landform is composed of five precisely formed terraces, which emerge from a wilder woodland edge of native trees and grasses. Tucked under the landform is the new building, which contains the largest living green wall in North America. The green wall covers over 4,000 square feet and encloses visitors in a rich tapestry of vegetation, transforming a walk down a corridor into a breath-taking new experience that culminates at a still water feature. 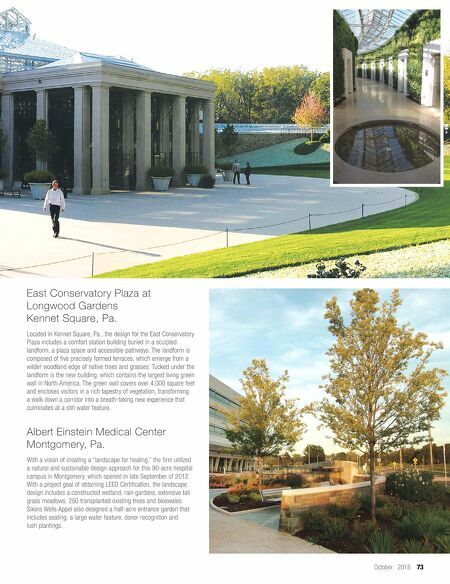 Albert Einstein Medical Center Montgomery, Pa. With a vision of creating a "landscape for healing," the firm utilized a natural and sustainable design approach for this 90-acre hospital campus in Montgomery, which opened in late September of 2012. With a project goal of obtaining LEED Certification, the landscape design includes a constructed wetland, rain gardens, extensive tall grass meadows, 250 transplanted existing trees and bioswales. 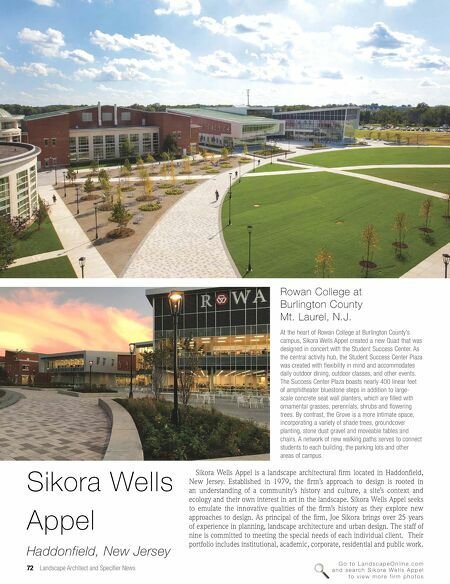 Sikora Wells Appel also designed a half-acre entrance garden that includes seating, a large water feature, donor recognition and lush plantings.